Learn which companies are more exposed to a possible decline in Apple's iPhone sales. Apple's latest results were a mixed bag. On one hand, the company reported record earnings of $14.50 per share on sales of $57.6 billion, beating both the Street's consensus and the official forecast. On the other hand, iPhone unit sales were less than expected, which combined with a lower guidance for the current quarter. That triggered a strong sell-off, as investors worry that global demand for the iPhone may be peaking. However, the biggest losers of a possible reduction in iPhone demand may be Apple's suppliers. There are several companies that sell a significant amount of their technological products to Apple, and depend heavily on Apple's overall performance. Simply put, the greater the portion of inventory sold to Apple, the more exposed they are to the Cupertino-based company. Cirrus Logic (NASDAQ:CRUS), which in 2013 got 82% of its revenue from Apple, could be the most affected. Qualcomm (NASDAQ:QCOM) and Skyworks Solutions, may also see a decrease in sales volume. How can these companies avoid a sudden decrease in market value if iPhone sales continue to weaken? As the smartphone arena becomes more commoditized, and new ambitious players like Lenovo adopt aggressive pricing strategies to win market share in territories previously dominated by Apple, the global demand for iPhones is likely to become more unstable. To avoid massive revenue fluctuations, Apple's suppliers must diversify their revenue streams as much as possible. Notice that, in its current state, Cirrus Logic is also is quite vulnerable to Apple's decisions in regards to the iPhone's pricing and choice of technology. Apple has enormous bargaining power, as Cirrus Logic sells most of its amplifiers, integrated circuits, and mixed-signal processing technologies to Apple. Rumors that Apple's new iPad Air may not include audio amplifiers manufactured by Cirrus Logic caused a massive sell-off last week, with shares going down more than 10% after the announcement. Fortunately, Cirrus Logic is attempting to diversify its revenue sources by entering new markets. For example, the company recently started to develop LED light bulbs, which can be sold to different companies. As the world's biggest smartphone chip company, Qualcomm is an important supplier to Apple, as it provides the company with cellular modem technology for the iPhone. Notice that Qualcomm also sells its products to Apple's competitors, and therefore is well-prepared for a sudden decrease in iPhone orders. Qualcomm recently announced its revenue rose 10% in the first fiscal quarter, easing investors' concerns that the chip maker may see a negative surprise due to Apple's lower-than-expected iPhone sales. The company reaffirmed a forecast of 5% to 11% revenue growth for the current fiscal year. Despite announcing strong financial performance in the latest quarter, Apple shares experienced a massive sell-off as sales for the company's flagship product came in lower than expected. However, the big losers here may be Apple's suppliers. Cirrus Logic, which makes most of its revenue from Apple orders, may be the most affected company. 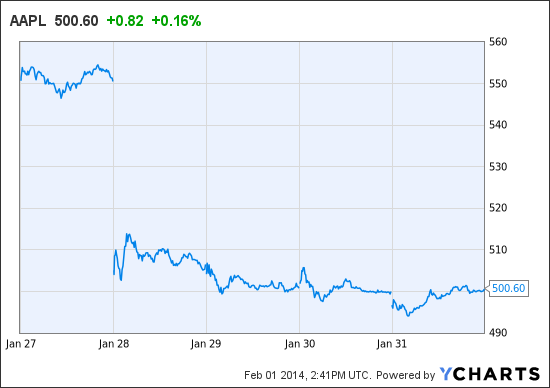 Since Apple's announcement, Cirrus Logic has lost more than 10% of its market value. It is important that suppliers reduce their exposure to Apple, by entering new markets, approaching Apple's competitors, and manufacturing technology that is easy to be adapted to different smartphone models. The good news is that Apple is still selling a huge amount of iPhones. Therefore, even if demand for Apple's flagship product eventually peaks, suppliers should have enough time to search for alternative revenue sources.